TrackWrestling took a beating this Saturday, but wrestling continued in Louisiana nonetheless. Comeaux won their second title behind champions Jake Verret, Pierce Richard, Kasey Toups and Kole Miller. Sulphur placed second. More may be found at Prolonged McMillan worth the wait. 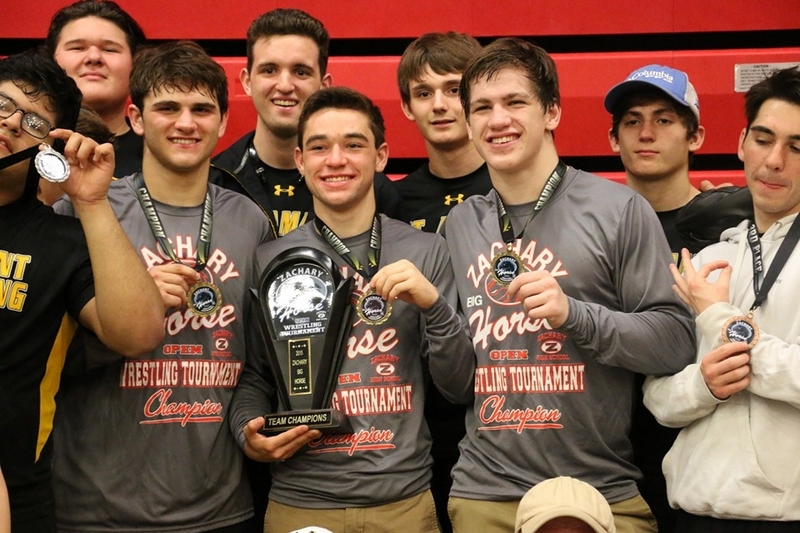 The St. Amant Gators won their third consecutive Zachary Big Horse title Saturday, led by champions Brier Babin, Sage Nugent and Jordan Averette. Live Oak placed second, followed by a talented, mostly second-string squad, from Brother Martin. St. Amant's full contingent (left), placers (center) and 120 lbs. champion Brier Babin (right). Baton Rouge's Ellis Herring defeated previously unbeaten Payton Wicker of Zachary 11-1 at 182 lbs. before succumbing to Averette in the finals. Brother Martin's Paul-Stephen Schmidt (113 lbs. ), Mason Middleton of Live Oak (126 lbs. ), Brennan Webb (145 lbs. ), East Ascension's Chris Reaux (195 lbs. ), Dylan Sweeney of Belle Chasse (220 lbs.) and East Ascension's Jordan Campbell also won championships. Live Oak's Brennan Webb, at 145 lbs., recorded four falls on the day and was selected the tournament's Outstanding Wrestler. The John Ehret Patriots won the Jefferson Parish Championship by a mere two points over Grace King Saturday at East Jefferson High School. Perhaps more important will be Jefferson Parish Division II bragging rights as the East Jefferson Warriors placed third, only seven points short of the Irish. The Warriors had the most champions of the day. James Montelaro (106 lbs. ), Gavin Hatfield (120 lbs. ), Nicholas Shields (126 lbs.) and Sean O'Flynn (170 lbs.) won championships for the host team. Joseph Davis-Lucas (132 lbs. ), Joshua Bell (138 lbs.) and Remy Toups (182 lbs.) won titles for Ehret. Brandon Willis (113 lbs.) and Robert Hudgins (220 lbs. ), making his first event of the season, won titles for Rummel. Perry Hawxhurst (145 lbs.) and Sagar Joshi (195 lbs.) of Grace King, Troy Bourgeois of Fisher (152 lbs. ), Shaw's Martin Garrett (160 lbs.) and John Bumgarden of Higgins (182 lbs.) won the remaining championships. The Holy Cross Tigers may not have placed as well as they did in the last two years, but they had something the other two teams did not - two Las Vegas Holiday Classic championships. Top-seeded Jake Rando at 145 lbs. and fourth-seeded Joey Foret at 152 lbs. won championships and the Tigers placed sixth in the 76-team field. 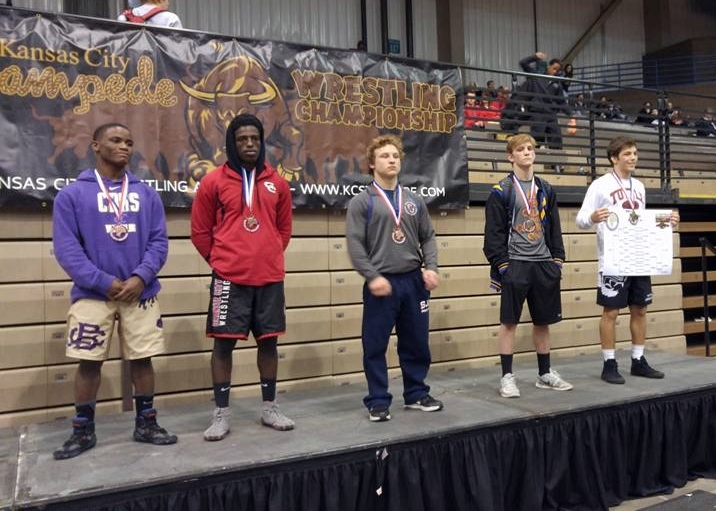 Accolades also go to former Brusly standout and two-time Division III state champion Kendon Lee Kayser, who placed second at the event. Kayser transferred to Stillwater High School in Stillwater, Oklahoma prior to the start of his junior year. Prior to the Kansas City Stampede he had a 7-1 record. If it was again a 16-man bracket, his record now should be 11-2. Fourteen teams are slated to participate in the 2015 Trey Culotta Memorial Tournament at Brother Martin Tuesday and Wednesday. The Crusaders will be favored to win their fifth consecutive team championship but should face some stern competition. A large challenge should come from Vestavia Hills, Alabama. The Rebels won their second consecutive South Walton Border Wars earlier this month - and event in which Holy Cross placed second and Jesuit third. The Crusaders' lighter weight classes is very strong. Luke Cotton (113 lbs.) has one out-of-state loss this season. Steven Shields (120 lbs.) and Stephen Rumney (126 lbs.) are undefeated. 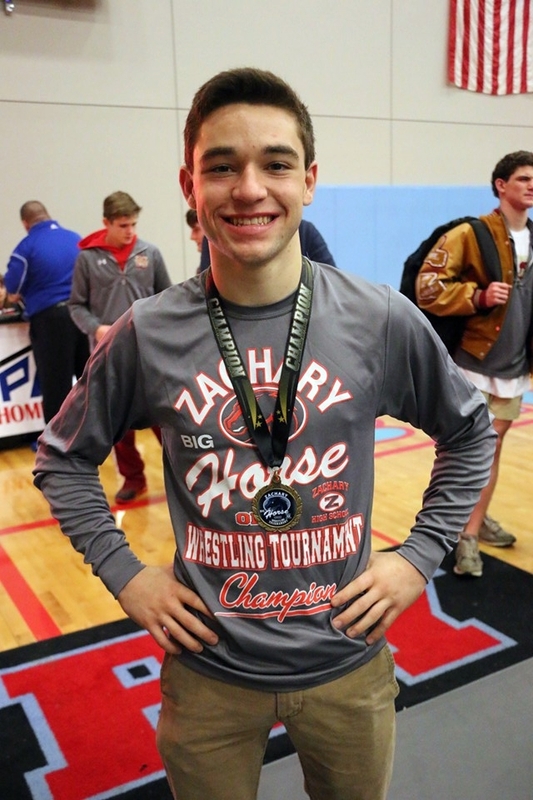 While their starters may not yet be set, the Crusaders should also get strong performances from Seth and Taylor Gambill, Patrick Evans and Ben Wisniewski in those weight classes. Yet Brother Martin is not without heavier standouts. Brad Guidry and Pierce Williams only have two losses on the season, and Travis Viener and Jacob Clapp have only one apiece. Kevin Casey has three losses, but only one to a Louisiana wrestler. The team championship may not be the most interesting aspect, however. The event will mark the first time that the Crusader starting line-up will be pitted against a very strong St. Paul's team. The Wolves' have several standouts which include 2015 Division I runner-up Hunter Bourgeois, whose only losses have come to his 2015 finals opponent, Jake Rando of Holy Cross. Brandon Stein has only one loss this season, as do Billy Harrison and Sam Dufour. Collin Francis is undefeated for the Wolves at 220 lbs. Airline High School of Bossier City, led by the currently undefeated 2015 Division I state champion Christian Walden, will also be there. Javarious Jones and Keegan Gilligan should be considered major factors for the Vikings. Comeaux, fresh off a Jacob McMillan championship, should prove very competitive. Kole Miller is 19-1 for the Spartans, having lost a one-point contest with the Crusaders' Pierce Williams. Catholic will feature Catholic's Cameron Carpenter (16-1) and Daniel Gunn (19-3). Interesting Division II match-ups are also possible. Blake Mateu (10-0) and Josh Ramirez (16-0) should be expected to do well for Rummel as will Robert Fairchild (17-1). Shaw will feature Cameron Bertot, Brad Albarado and Matthew Blair (17-0). The Rayne Wolves should have contenders in Cooper Simon and Tyler Carriere. Most interesting re Division II teams will be Teurlings Catholic. 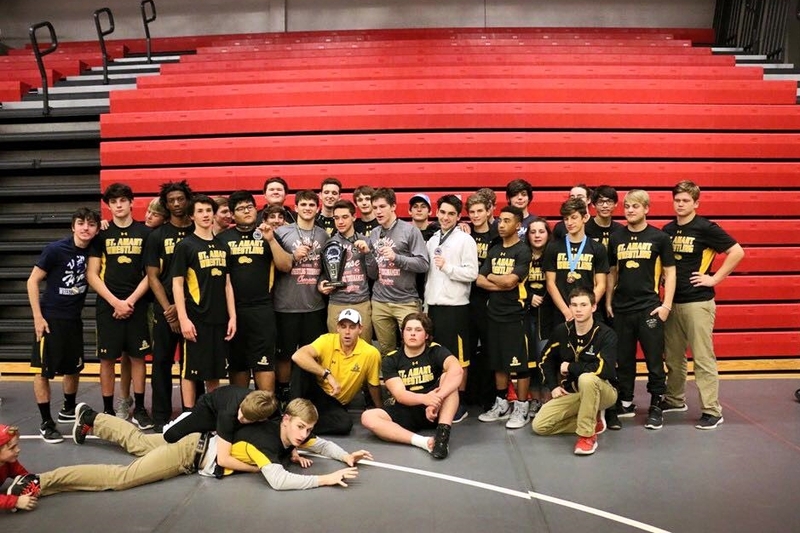 The strength of the two-time defending Division II champions is not well known, aside from the fact that they won the Stanley Rauch Duals at Shaw earlier this month. The Rebels will be led by three-time Division II state champion Brock Bonin and two-time runner-up Kynan Sonnier.